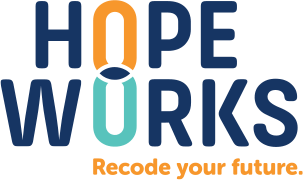 Hopeworks youth are busy this spring with so many new opportunities coming their way! Trainee, Chasity Medina, for instance was recently hired at WeScrimmage, a Mobile Learning App Company, and will be starting her new full-time internship this March. Chasity began the Hopeworks training program in August of 2018 and says that she was attracted to the program because of the graphic design portion of it, “being able to learn graphic design through the computer and the internship opportunities is what we really brought me here” she said. In her new role as a WeScrimmage intern, Chasity will complete projects for the company such as video creation and editing, as well as social media management. In the future, Chasity wants to pursue a career in advertising, utilizing the computer, editing and graphic design skills that she’s acquired through the Hopeworks training program. Now on a path to getting her dream job and moving into her own place at 19 years old, Chasity says her motivation for everything she does is “to prove those who doubted me wrong”. She says that the people in Hopeworks are also her motivation and that she wants everyone to see her succeed so that she’s able to share her experience with others. In regards to starting a new job at WeScrimmage, Chasity says that she is nervous but also really excited and looking forward to learning new things.